It can be hard to identify weeds such as this, as many look the same when they are very young. I will say that there are many herbicides that target broad leaved plants, and will not harm grass if used appropriately. I recommend doing a search for broadleaf herbicides and choosing one that suites your needs. 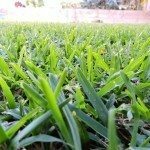 This will take care of your issue without doing much harm to your lawn.